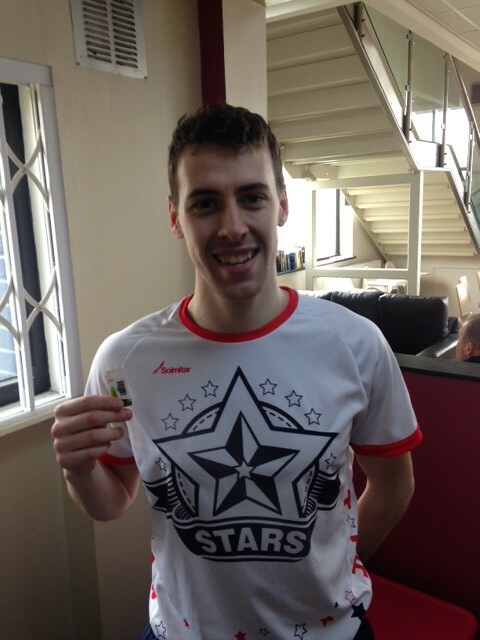 Today was the day that Arrow Valley parkrun reached for the stars, not just any stars, the Redditch Stars! During the year our local running club take over all of the volunteer roles and even provide cakes and bananas, lots and lots of bananas. It was, therefore, fitting that both the fastest male and female runners were club members, Brad Allen and Jo Scott. More about their fine achievements later. 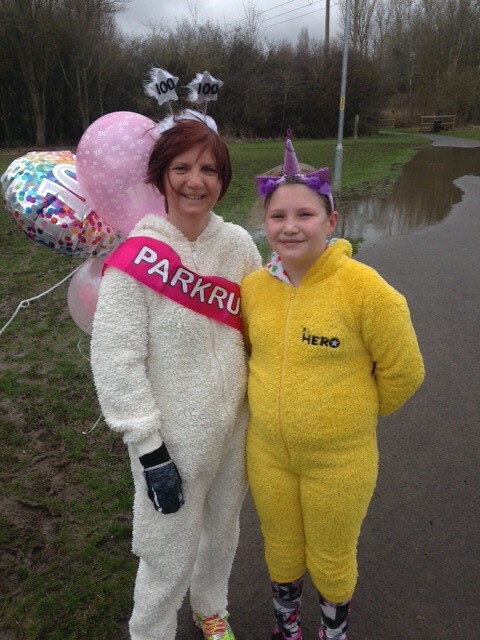 To ‘celebrate’ National Sleep Day, parkrun invited runners to run in their pyjamas! I was slightly worried that there may be some embarrassing wardrobe malfunctions but I am pleased to report that it was far too cold for that to be a problem! 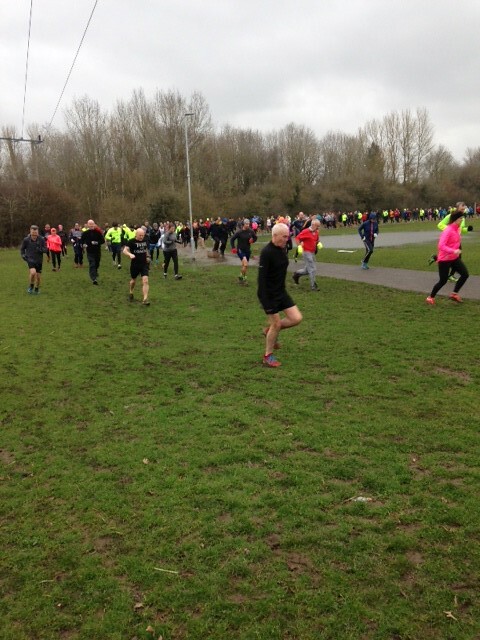 I think that a few regulars decided to take ‘National Sleep Day’ too literally, so numbers were down a little with 313 keen runners braving the elements for Arrow Valley’s 298th park run. It is the first time that I have volunteered and was probably just as well that I wasn’t running considering that I was nursing one hell of a hangover following four days at the Cheltenham Festival. Volunteering really makes you appreciate all of the work put in by the heroes who do this week after week. It was nice to be able to give them a well-earned rest. I was also surprised how many volunteers are required for the different roles, 45 in total today. Everyone did a great job but I would like to mention Linda Beresford and Mindy Jones who gave out the finish tokens and had to put up with me for the duration of the run, and also Hannah Barker who had the fantastic title of Funnel Manager. In my experience, it always pays to have a nice well tended funnel. 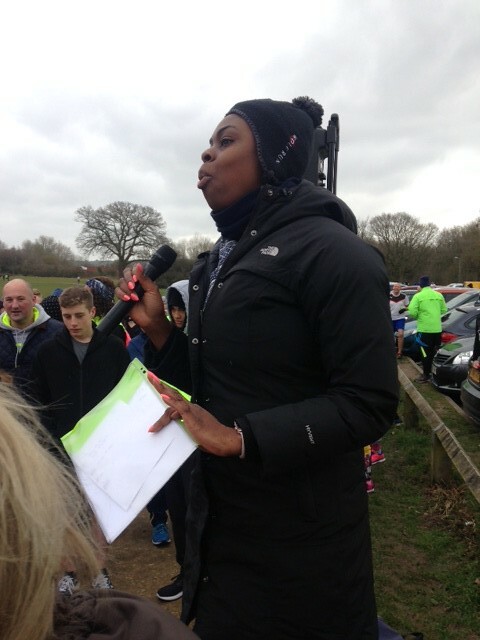 Nicola ‘Did I tell you I ran a marathon?’ Noel did a brilliant job with the pre-run briefing and announcements. Very funny and quite scary at the same time. My favourite bits from her address included, “You will do not one lap, not three laps, just two, no negotiation, we don’t run a corner shop!” and “No pushing or shoving or we will have you out!” Two volunteer jobs have interesting titles; ‘Lead Bike’ and ‘Tail Walker’ which were performed with great enthusiasm by Victoria Lewis and Louise Houghton. I feel obliged to also make a special mention of Karen B. Lee (aka Lady Beoley) who had two jobs. Token sorter and chief shouter-outer of the first lap times. The latter job required Lady B to expose one hand to the freezing elements and she almost lost her fingers to frost bite. I was pleased to offer my armpit to bring said hand back to normal body temperature (other warm body parts were available but were declined!). Talking of the weather, it was absolutely freezing. Only one degree centigrade but with a chilling wind and a mixture of snow and hail blowing in across the lake. The runners were huddled up together before the start trying to find some warmth and shelter from the wind. It was a bit worrying to see a couple of brass monkeys walking around carrying welding gear. Following the ‘Beast from the East’ which led to the cancellation of the parkrun a couple of weeks ago, and the big thaw which followed, a new lake had formed across the path, which meant that the runners had to splash their way through about 10 metres of ankle deep water within the first minute of the run! A few wimps took the scenic route but got a bit bogged down in the mud. It looked a bit like the Wolf Run out there! I was impressed with how people wore running vests or short-sleeved tops. They are a bit crazy in Redditch! I guess that they had to run faster just to keep warm and that is exactly what 21 people did, recording personal best times. This included Brad Allan who finished first in a new PB time of 18.25. It was also the first time he has finished first in a parkrun, so he was naturally delighted afterwards. Adam Hill finished 2nd in 18.34 and Richard Gallois finished 3rd in 19.22. I could see from the warmth of the café that Brad was in the lead at half way and waved at him, in between bites of my bacon sandwich, but I don’t think he noticed. Jo Scott was the first lady to finish in 26th place overall and in a good time of 21.34. Rachel Davies was 2nd fastest in 22.04 and Helen Chapman was 3rd fastest in 23.10. Steve Taylor was the first person to finish in PJs in 16th place in a time of 20.50. Roland Rignall and his 18th month old daughter Penny were the first push-chair combo to finish in 11th place and Lui the Black Labrador was the first dog to pass the line in 91st place and a time of 26.42. This was all the more commendable considering the fact that he had to pull his owner Nicholas Diamond all of the way round and didn’t have any toilet stops either! Two impressive milestones were reached by Lesley Rowlands who has now run 100 parkruns and Charlotte Meekins who has completed 50 parkruns. Both were sporting sashes, head boppers and big balloons with the numbers on. Lesley was dressed in a rather natty white fluffy onesie supported by her daughter Mollie who had a bright yellow ‘Easter Chick’ onesie. There were 28 first timers including 20 people who had never run a parkrun before, anywhere. Incredibly, John Trueman managed to finish in 33rd place in 22.04. One to watch next time for sure. I hope that they all had a great time and weren’t put off by the cold temperatures. It was impressive to see how much effort the runners put in and in a strange way quite satisfying to see how many people looked as exhausted as I normally am when I run. I hope to join them in two weeks time.